It is that time of year again - my favourite in fact, when Mulberry showcase their take on the new season. This seasons invitation - a butterfly cleverly weighted to sit and balance anywhere was interesting and interactive. Mulberry have had great fun with this in the lead up to the show, with the butterfly appearing on a taxi, on a Claridges doorman and in other random un-butterfly like places. Throughout the show Twitter@MulberryEditior was keeping us all up to date with pictures of key pieces/fabrics in the show. A nice way to describe what was coming down the catwalk, in more detail. 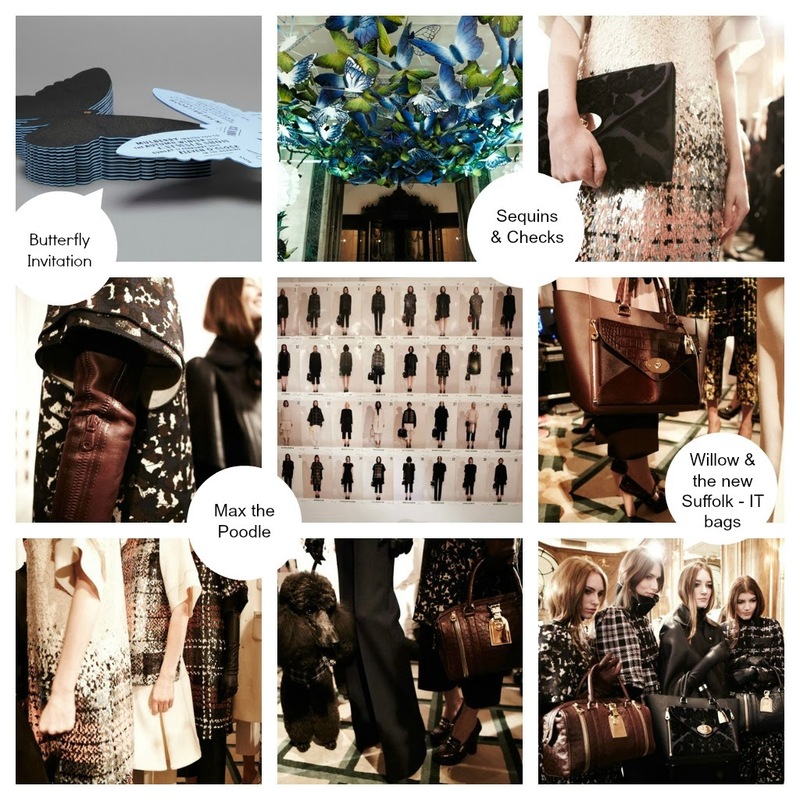 The wonders of modern technology mean that within a couple of hours of the show all the details, looks and interviews are already on the Mulberry website - below is a collection of images from both the official website and blog summing up the new collection and the feel behind AW13. With an rural England theme, the AW13 collection proves further how Mulberry always manages to return to it heritage roots, this season using floral elements in interesting and unexpected ways. A collection with a varied mix of fabrics (leather, tweed and sequins), mixed colour palettes (dark autumnal colours such as plum, black, grey and teal with lighter highlights of white, pastel pink and bright yellow), and varied textures including fur trims, sherling and angora. Made up of simple seperates that can be worn alone or layered up - skinny trousers, tunic style tops, pleated mini skirts in supple leather, cape like coats, simple skater dresses and lots of gloves - in both the classic size and elbow length. 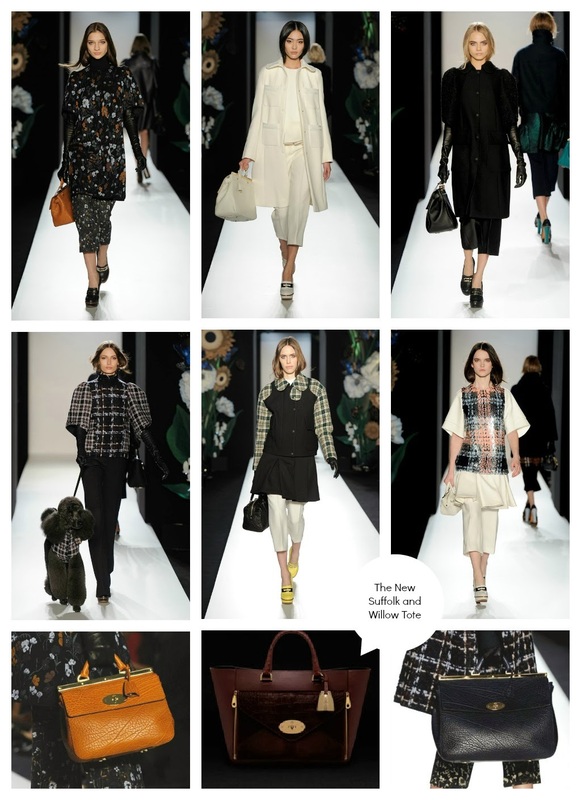 As usual a large part of the collection is the famous Mulberry bag. Every season Emma Hill wows us with such beautifully crafted pieces of leather art that are perfectly on trend but at the same time a timeless classic piece that all women should have in their wardrobe. This season was no exception, along with updates to the SS13 Willow tote (which i actually prefer in the autumnal colours rather than the spring pastel tones) and the classic Bayswater, the new AW13 bag is called the Suffolk. A very ladylike bag with some beautiful classic Mulberry elements and hardware. 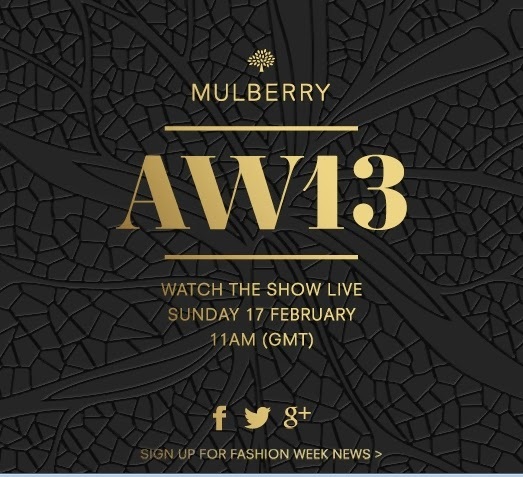 As usual after watching the Mulberry show i feel really inspired - loving a lot of pieces in the collection. I really love that Mulberry also cater to man's best friend - Max the poodle models the doggie wear so well, although Willow was sad to see no kitten wear made it onto the catwalk! What did you think of the show / collection?